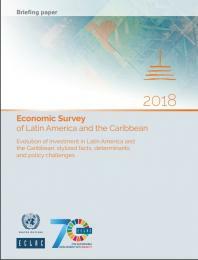 The 2018 edition of the Economic Survey of Latin America and the Caribbean, its seventieth issue, consists of three parts. Part I outlines the region’s economic performance in 2017 and analyses trends in the early months of 2018, as well as the outlook for the rest of the year. It examines the external and domestic factors that have influenced the region’s economic performance, analyses the characteristics of economic growth, prices and the labour market, and draws attention to some of the macroeconomic policy challenges of the prevailing external conditions, amid mounting uncertainty stemming mainly from political factors. Economic Survey of Latin America and the Caribbean 2018.